I’ve never seen this kind of vegetable vendor in my city (Bogor, West Java, Indonesia). Around here, all vegetable vendors are male; and they are carrying carts. In my husband’s hometown, all vegetable vendors are female; but they are taking baskets to carry the merchandise. I saw this woman when we’re on the journey to my grandfather’s house. At that time, we had our chicken porridge for breakfast on a small food stall in Tasikmalaya city (West Java, Indonesia). 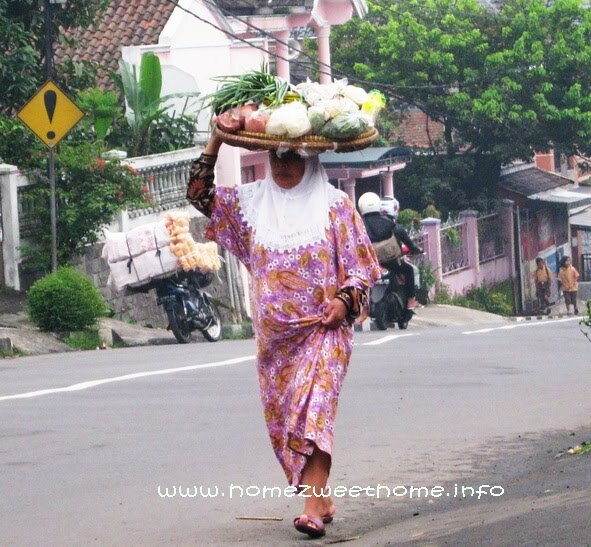 This woman uses a tray to carry vegetables. Is it too heavy for her? A yellow sign on the left indicates that she has just walked on the ascending road. She didn’t look tired at all.